Baxter Summer Leadership Program: Application Closing! The Baxter Summer Leadership Program (SLP) application window closes at 11:59 PM on Tuesday, April 30th. Any applicants who have previously applied for this year's SLP opportunity with this link: they have the application and do not require a resubmission. If you’re looking to get a Software Development Internship at any tech company check out this course. Admissions are closing soon for CodePath's free Technical Interview Prep course. Last year 70% of their alumni received technical internship and jobs at companies like Microsoft, Google, Amazon and more! The course is almost full: apply before May 5th! Free access to CodePath’s fall Virtual Career Fair w/ 50+ employers. Last year - 70% of students received technical internships! Make the most of your summer and land a sweet job! Deadline to apply is May 5th, 2019. Hackster and The Chinese Ministry of Education present the 6th annual China-U.S. Young Maker Competition: Co-Making The Future! Young makers (18-40 years old) are encouraged to submit their innovative projects with a focus on areas of community development, education, environmental protection, health & fitness, energy, transportation and other areas of sustainable development. These projects can be either focused on hardware or software, and all students are encouraged to participate. $41,000+ in prizes! The top ten US projects (semi-finalists) will be selected to compete in the Finals in Beijing, China with an all expenses paid trip. The judging panel includes Adam Benzion, Founder and CEO of Hackster, Bill Luan, Senior Program Manager of the Google Corral team, and Aimin Zhu, University Relations Manager, Google China. Be sure to submit projects no later than May 26, 2019! 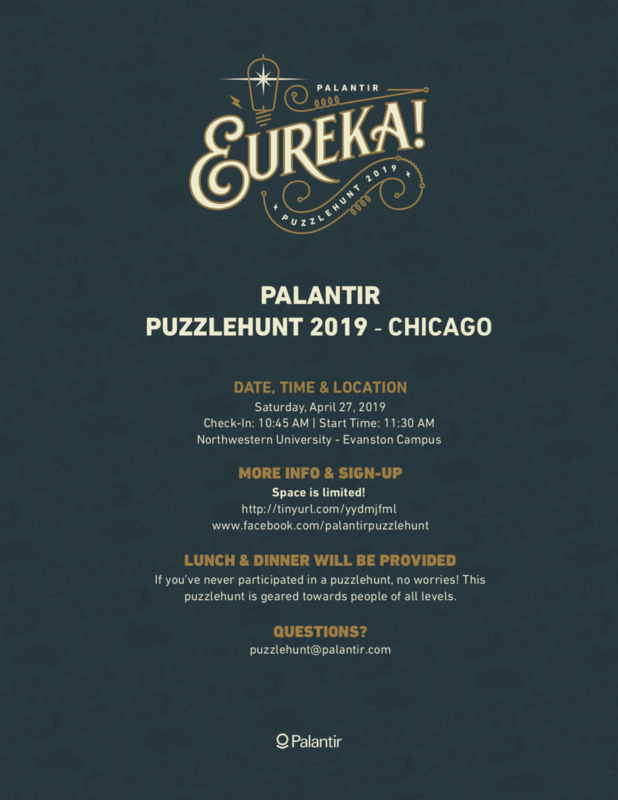 More information and registration is available at: http://tinyurl.com/yydmjfml, also check out the Facebook page: https://www.facebook.com/PalantirPuzzlehunt/ for pictures of prior hunts. WHAT IS TARGET LAB x CHICAGO? 7:15 PM – Lab activations including: career coaching, express makeovers, professional headshots, networking, music, food & drinks, and more! Harvard offers a week-long summer program for rising seniors with an emphasis on providing an opportunity for students of diverse backgrounds. There will be an info session with a panel of 3 other U of I students that participated in the program on Monday, April 8th at 5pm (location TBD). This is a selective all-expenses paid opportunity for freshman and sophomore students to visit P&G headquarters and network with P&G leadership in Cincinnati, OH. Get a head start on applying to P&G by participating in a final interview for an internship offer during the 3-day event. An hour long session which discusses common communication pitfalls in the workplace, practical tips to improve communication, and discussions on how this might best work for recruits. This is not a consulting specific presentation. Meet with a current Bain employee to learn more about our Associate Consultant and Associate Consultant Intern roles. Timeslots will open on Friday, March 29th at 12:00 PM. Please sign up for only one timeslot via the Bain website here. There is no dress code for these events. AT&T L1VE is a fast track option for candidates interested in their Leadership Development programs. This all expenses paid trip to Dallas will put you among the best and brightest in your field and will feature competitions, client interactions, tours, networking and fun. Final round interviews will happen on-sight for all attendees! You will have the opportunity to learn about AT&T’s Development Programs – straight from the experts! You’ll network with AT&T’s senior leaders and technology gurus all leading towards the potential opportunity to leave with an offer to start an amazing career at AT&T. What did last year look like? Here is The AT&T L1VE Experience from 2018. Strong leadership requires a lot more than a title. It requires vision, confidence, teamwork, and a strong sense of integrity. The Deloitte Consulting Leadership Conference aims to strengthen these qualities in today’s best and brightest students to assist them in becoming the business leaders of tomorrow. The Deloitte Consulting Leadership Conference, led by Deloitte Technology and Human Capital Consulting professionals, will bring select freshmen and sophomores together to participate in an interactive event focused on developing both leadership and consulting skills. You will hone your team-building, interpersonal, and communication skills in an exciting, dynamic environment. This conference is sure to be a rewarding and thought-provoking experience with lessons you can apply throughout your university career! To apply for the Deloitte Consulting Leadership Conference, please complete this application. The application must be submitted before 11:59 PM CST on Friday, March 22nd. Resumes are not required but are recommended with your application submission. To submit your resume, please email UIUC Consulting Campus Recruiting using the following email subject: UIUC Deloitte Consulting Leadership Conference. Save your resume with the following format: Last Name_First Name_Expected Graduation Year [YYYY]_Expected Graduation Month [MM]. Please contact Emily Rock and Joydeep Ganguly if you have any questions. To find out more about Deloitte and our Analyst Programs, please visit our website. Potential paid Engineering Intern opportunity for a junior, senior, or grad student with FedEx Express in the Chicago area this summer. The position details are posted on Handshake and also on the fedex.com website under the careers link. On the FedEx site, it can be found by entering RC136586 in the job search field. The posting closes on March 8th, 2019.